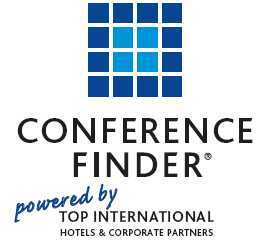 The "conferencefinder.com" is an initiative of TOP INTERNATIONAL Hotels & Corporate Partners. This service is owned and governed by TOP INTERNATIONAL Hotels GmbH in Duesseldorf, Germany. The company with its partners markets 400 hotels throughout Europe; one third of those properties offer in house conference facilities and a exclusively selected part of those are represented in the print brochure TOP MEETINGS. An interactive online version is available under conferencefinder.com or here. With this combination TOP INTERNATIONAL combines traditional print media with interactive and state of the art media and technology. The distribution of the conference bookers focused TOP MEETINGS brochure is closely connected and supported with the conferencefinder.com. The conference portal is at the time being programmed and an exclusive agreement has already been signed with the leading online conference booking system of tagungshotel.com for cross selling and mutual partnership.